The web's ultimate tennis instruction resource for players looking to improve their game. FREE Online Tennis Tips - It's all here... and more! 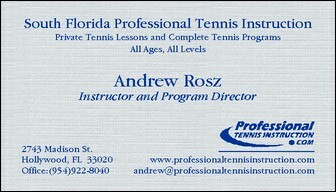 Professional Tennis Instruction at its BEST! Welcome South Florida Tennis Players and Parents! 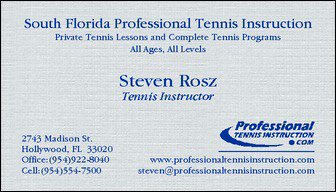 Professional Tennis Instruction Dot Com is your ultimate tennis instruction resource for tennis players of all ages and all levels and official home of South Florida Professional Tennis Instruction (SFPTI). And our Youth Excellence Tennis Program; an affordable alternative in providing personalized World Class "one-on-one" expert tennis instruction for talented young players age 3 to 16 aspiring to become among the best tennis players in the world. Parents... If your child truly loves the game of tennis and already shows signs of becoming a champion, we can help turn his or her dreams into a reality as we specialize in teaching world class professional tennis to talented young players. CLICK HERE to learn more! Attention All Serious Tennis Players... Our all new World Class Tennis Program (WCTP) series of professional tennis instruction training manuals are used by more tennis coaches and teaching pros worldwide. And for good reason! They are the same tennis instruction training manuals used by many ATP and WTA tour players to help them become better tour players. And now, you too can use our WCTP tennis instruction training manuals to take your game to even higher levels. Considered by many to be among the best instructional tennis publications ever written, our WCTP series of tennis instruction training manuals contain the fundamental wisdom of what all successful professional tennis players must learn, and what most qualified tennis instructors routinely try to teach their students. CLICK HERE for more information and to read the first chapter from each volume online for free! And while you're here, be sure to check out our entire collection of Tennis Books and Training Manuals fully-documented in manuscript-form on printable e-book CD; written exclusively for players who prefer to be "self-taught." CLICK HERE for more information and to read the first chapter from each book online for free! Parents... Our Youth Excellence Tennis Program (YETP) for "one-on-one" private tennis instruction for young children and teens is limited. Accordingly, please contact us by telephone for up-to-date scheduling and space availability. But before you call... please CLICK HERE to learn more about this extraordinary tennis instruction and training opportunity for talented young tennis hopefuls age 3 to 16 on the fast-track to success. Young Player's Pages | Our Private Photo Album | Links and Resources | Legal Information | Link To Us!